For more than a decade my growing collection of more than five hundred precious LPs languished in a groaning Dexion rack. 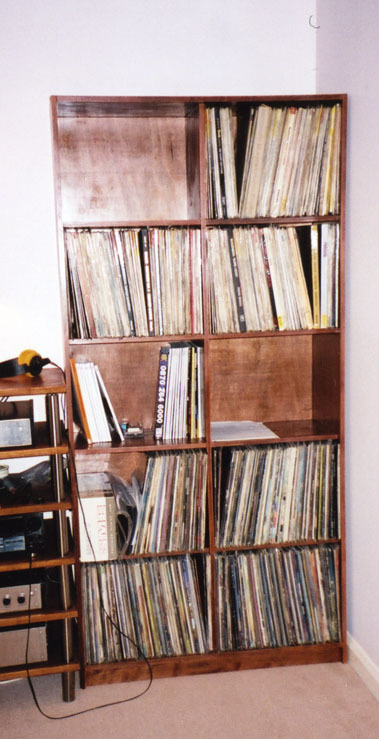 This was always intended as a temporary measure, and although it was never quite right for the job - it sagged woefully after a while, and didn't really support the LPs at the ends of the shelves properly - it simply stayed because I couldn't find any reasonably-priced alternative. As the rest of my system became more domestically acceptable, the black industrial structure looked increasingly scruffy. My success in building a presentable pair of speakers, and more recently a set of shelves for my electronics, gave me some confidence in my woodworking skills. When I found a space between the more urgent jobs in the new house, I decided to get my power saw out. The shelving system is built from 15mm beech-veneered chipboard, and the back is 9mm plywood, glued and screwed to the rear of the shelves for reinforcement. The shelves are attached to the uprights with dowels and glue. The vertical strip at the front, below the bottom shelf, acts as extra reinforcement. I darkened the unit with spirit-based "Indian Rosewood" dye from Colron, and finished off with three coats of Ronseal Ultra Tough satin varnish. I decided to allow a slight overhang of the LPs over the front of each shelf to make access easier, but to build the unit overall deeper than the LPs to make it look tidier. The inner dimensions of each "cell" are 33cm (H) x 42cm (W) x 30.5cm (D), while the outer carcass is 180cm (H) x 89cm (W) x 34.5cm (D). The shelves and the central divider are recessed by about 3cm behind the front of the outer shell.